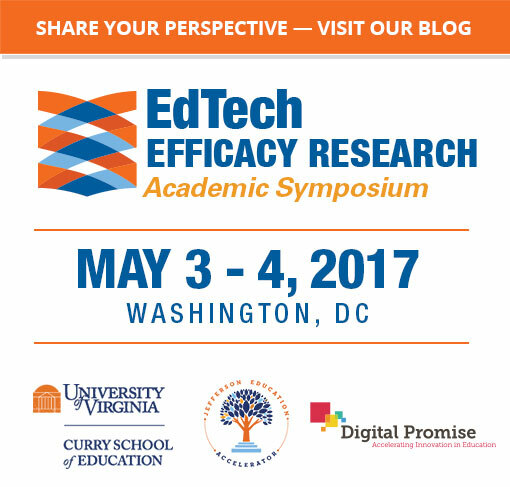 To what degree do education philanthropies use efficacy research to make decisions about which EdTech organizations (both for profit and nonprofit) to fund? To what degree do these philanthropies use efficacy research to evaluate the effectiveness of their program investments? Should some change their approach? As philanthropies have developed what Rick Hess describes as a “muscle” approach to supporting education, there has also been a stronger push for funders to require and support evidence of the impact of the interventions they support. We know that nonprofits want to be able to understand their influence and are building capacity to increase their abilities to measure impact. We also know that those nonprofits need more help than they are currently getting from foundation funders in order to measure performances. What we don’t have a good handle on is which philanthropies are funding education technology interventions and the nature of the information that they are collecting on the impact of those interventions in the classroom. Group H is currently examining the question of what evidence are philanthropies gathering about the impact of education technology interventions. First, we are identifying which philanthropies have provided support for the explicit use of education technology in the education, funding the use of platforms, services or apps in the classroom. Secondly, we are interviewing foundation staff to ascertain how they characterize the evidence of the impact of that technology, the levels of evidence from perspectives of utility and feasibility of technology implementation, and the robustness of evidence to support causal claim of the impact of technology. We welcome comment, references to others who are examining these issue with philanthropy, and interest in working with use. Please contact Edith Gummer, egummer@kauffman.org. 1 Brock, A., Buteau, E. & Herring, A. 2012. Room for Improvement: Foundations support of nonprofit performance assessment. Center for Effective Philanthropy. I am interested in the work of this group. I am on sabbatical spring semester 2017 with a focus on integrating technology within all courses in the School of Education and working with area districts to identify skills that PK-12 teachers are expected to demonstrate. As a part of this process I am seeking to establish methods of providing evidence of the impact of faculty technology instruction on teacher candidate demonstration of effective technology use in instruction and assessment as measured by increased student outcomes. Bill is the author of Teaching Machines: Learning at the Intersection of Education and Technology, and Sage on the Screen: Education, Media, and How We Learn. In past lives, he founded a series of successful startups in the technology and media areas. Edith's focus is research on innovation and entrepreneurship in education. Her prior experiences include program officer at the National Science Foundation, senior research scientist at WestEd, and research director at Education Northwest. Keith is CEO of CoSN, a nonprofit that serves as the voice of K-12 school system technology leaders. He has a global reputation as a key thought leader and has served on a joint EU/US committee planning a joint research agenda for eLearning. Linda is the founder and CEO of Agile Mind, Inc., an education company that has pioneered the application of emerging technologies to transform the teaching and learning of mathematics and science in middle and high schools. Linda previously founded Cogito, which developed supplemental digital resources for critical competency subjects in higher education. Mark serves or has served on the Board of Directors for Credly, Fishtree, Graduation Alliance, Orchestro, Think Through Learning, MediaSolv, Lightningcast, Moodlerooms, and Workspace.com. He has been investing in high growth companies since 1992. Mark helped to found and served as Board Director of the Baltimore Chapter of the Network for Teaching Entrepreneurship and is Board Chair at Emerson Preparatory High School in Washington, D.C.
Matt has been superintendent of the Piedmont City School District for the last thirteen years. His district has been recognized nationally for its innovative approach to teaching and learning. Matthew is Associate Vice Provost for Digital Education and Innovation at Duke University. He was previously founding Vice President for Learning Technology and Innovation at UNC General Administration. He previously led product management teams at Wireless Generation and co-founded the strategy group at Ithaka, an incubator of higher education technology ventures. Melina leads the department’s educational neuroscience efforts as Director of Education for Neuroscape, a new center that aims to bridge neuroscience and technology. Melina has spent 15 years at the forefront of learning neuroscience, and now applies research to solving real-world problems in education and technology. Sara is the founding Director of the League of Innovative Schools, Digital Promise’s flagship initiative, and also oversees the organization’s work on education innovation clusters, maker learning, and leadership professional services. Prior to Digital Promise, Sara worked as a consultant for Pearson and the NJ Department of Education. At TLA, Saro focuses on understanding if, how, and when K-12 blended learning is effective nationally. She has ten years’ experience in researching/evaluating public, private, and non-profit education programs, most recently as inaugural assistant director of two research units in the College of Education at The University of Texas at Austin. Stuart joined K12 as the company’s chief executive officer in February 2016. Most recently, he served as executive chairman and prior as chief executive officer of Catapult Learning, Inc. Prior to joining Catapult Learning, Stuart was the President of Postsecondary Education at The Princeton Review.